I’m good at staying on task and getting things done. I’m not a procrastinator. And that’s mostly great, except for when it’s not — when I miss tomato sandwiches and peach pies because I’m too busy to go to the farmer’s market. When I miss eclipses and meteor showers because I’m getting the recommended amount of sleep. When I stay late at my job every day because the work never ends. Infinity is not a loop, it’s a to-do list. So my plan, to keep myself from missing October (and its particular quality of light, the electric charge in the air and the fire of foliage gathering momentum as it moves from the high mountains to the foothills), is to get out of Asheville each weekend. Even if only for the afternoon. Even if only for a drive to the next town. That’s how I ended up in Hendersonville. 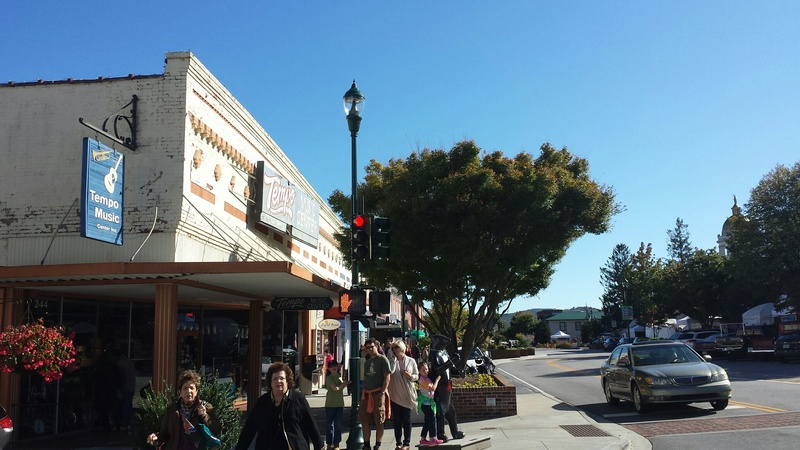 What I tell my husband, as we move along Main Street at a crawl, is that it’s exactly like Asheville with the crowds and the window shoppers, only everyone is old. “And from New York,” he says. That may or may not be true. There is a booth at the craft fair that’s further clogging Main Street, where you can sign up for delivery of the New York Times. Really, Hendersonville is nothing like Asheville. It’s cleaner and brighter. Its streets are wider and its parking is free. The handful of blocks that make up downtown are washed by cold air, bright sun and burnish blue sky. Each white tent in the craft fair is manned by a middle aged artist with boundless enthusiasm for earthenware, oil paintings and batiked clothing. I’m exaggerating, but not by much. Women in whimsical glasses and matching whimsical clogs buy lawn art and wall hangings. Things for their mountain houses. There’s a real estate business every half a block selling mountain houses. There are doors to upstairs lofts on Main Street that claim to be vacation rentals. The town glitters with tourist money and antique stores. Everyone is in the antique stores. (Everyone is everywhere — khaki-clad families eating ice cream despite the first chill of autumn.) They sift through arrowheads and lift ladder back chairs testing the weight. The antiques are post-Victorian and mid-century American. There’s no sign of Appalachia, but this isn’t where you go if you want Appalachia. I buy a vintage postcard of New York City and a wide-brimmed Fedora that costs too much but fits my head perfectly. We eat in the Irish pub with the grouchy waiter who doesn’t seem grouchy, but apologizes for his grouchiness to the table behind us. “It’s just been one of those days,” he says. Our table overlooks the street where every third person walks by with a tiny dog. There are signs everywhere saying no dogs in the craft fair area, but no one cares. The bikers have dogs. The older ladies have dogs. A couple walks a longhaired dachshund, a man with a standard poodle stops to talk to a man with a toy poodle. We take the long way back to the truck, criss-crossing Main Street, walking on the quieter streets and looking into the windows of businesses that are closed on Sunday. Most of them are modern and geared toward tourists. A few seem lost in time — a seamstress shop, a barbershop. I want to stay longer and daydream about what sort of shop I’d open. Vintage clothing is the obvious choice. Books are next, but there are book shops already. One of the antique stores has an entire upstairs nook packed full of books in a string of rooms as small as closets. I could live in such a place as the book loft. Reading dusty volumes of poetry and collections of Indian recipes. William Blake and Ron Rash, Edith Wharton and Beverly Cleary. This entry was posted in Books, essay, travel, Writing and tagged books, essay, October, travel. Bookmark the permalink.